Reversible Homogenizers used at W&F Manufacturing have cut batching times in half for their pigment and plasticizer dispersions. In cash, the time savings amount to between $1,000 and $2,000 per week. The reversible homogenizers cost a fraction of what equivalent mixing equipment might have cost. Since September 1978, W&F Manufacturing has spent less than $15,000 on four reversible homogenizers where they might have paid $60,000 for mixing and dissolving equipment of an equivalent capacity, and they got superior performance too. W&F Manufacturing mixes pigments and plasticizers in paraffins, oil and other solvents to make wax candles, pomanders and other products. The pigments have to be wetted and mixed thoroughly to provide consistent color repeatability. Dissolving the plasticizers in solvents used to require, with former equipment, batching times of unwieldy lengths. The reversible homogenizers have accomplished these difficult mixing operations quickly without requiring any downtime for maintenance. Before W&F Manufacturing purchased the reversible homogenizers, color development with inorganic, non-oil soluble pigments was incomplete within practical batching times. The homogenizers submit the pigment particles to shear high enough to provide complete color extension of the pigment. Batching times have been reduced significantly and scale up from lab size homogenizers can be done confidently. 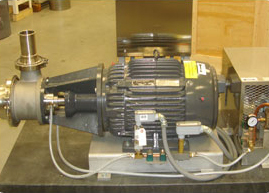 A laboratory model reversible homogenizer is used to project the conditions necessary for full-scale production. This, too, represents an improvement over the equipment used previously; incomplete color dispersion with that equipment would necessitate batch color adjustments which are costly both in operating time and wasted materials. The reversible homogenizers are also used to facilitate the dissolution of resins, like polyamid, and plasticizers in wax, mineral oil, alcohol and other solvent systems to make clear transparent candles, candle holders and other products. Ethylene-vinyl acetate copolymers and other plasticizers are used extensively in some formulations. The dissolvers used previously did not create enough shear force to incorporate the additives, usually purchased in pellet form, into the solvent within a reasonable time. The reversible homogenizers have reduced dissolution time for plasticizers from 45 minutes to 15-20 minutes. For transparent wax candles, batching times have been reduced from 2-1/2 hours to less than 1 hour. 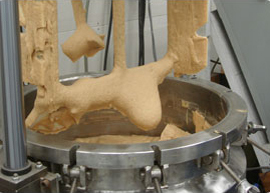 In general, W&F Manufacturing has found that the reversible homogenizers cut batching times by 50%. 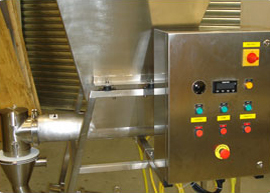 The reversible homogenizers have been installed on stainless steel batching kettles with steam or electrically heated jackets. 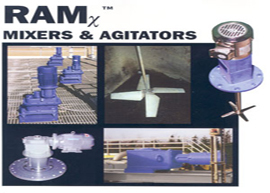 The homogenizers have a rotor that operates between two stators to provide high shear. Mixing is accomplished in two phases. 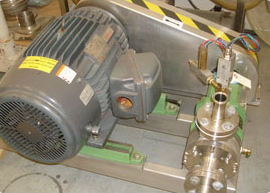 First, the particles are wetted in the solvent as the rotor causes a downward mixing action. 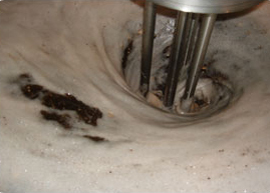 During this phase of operation, a vortex forms as solvent is pumped down through the mixing head and the particles are distributed within the solvent. During the second phase of mixing, the direction of spin is reversed causing an upward flow through the mixing head. 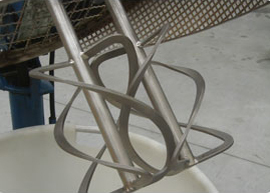 This direction of flow through the head creates the intensive mechanical and hydraulic shear. A baffle plate above the head directs the stream outward against the wall of the kettle to move the entire mass within the kettle. Periodic reversing of the direction of rotation eliminates dead spots and ensures that the dispersion is complete. W&F Manufacturing is very pleased with the trouble-free operation of the reversible homogenizers. The homogenizers have provided consistent dispersions at a great savings in time and labor, and the initial cost savings have made the reversible homogenizers a good investment.